Who hasn't wanted to be a member of the Mariners ground crew, at one time or another? 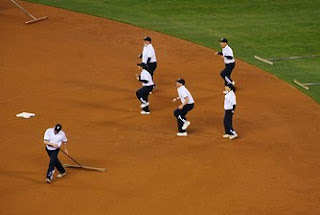 You get to be right on the field among the players; you get to drag those big rakes; you even get to do that little dance, whether or not you show any special gift for dancing. You may wonder what such an opening paragraph has to do with the Bellevue Farmers Market or eating well, but stick with me, faithful reader/eater, because today's UrbanFarmJunkie post is all good news, all the time. For starters, pitchers and catchers have reported to Mariners Spring Training in Peoria, Arizona, starting the cycle of hope all over again. So what if the Angels signed Albert Pujols? This might be the year! We're already playing .500 ball, since the reset button has been hit and everyone's 0-0. That ground crew isn't just raking Ichiro-trodden dirt, they're raking hope! 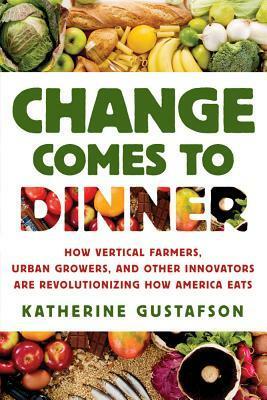 I'm into "hoperaking" lately, having greatly enjoyed Katherine Gustafson's Change Comes to Dinner: How Vertical Farmers, Urban Growers, and Other Innovators are Revolutionizing How America Eats. Gustafson coins the word to describe her mission of traveling around the country finding hopeful stories of where food is going right. She ranges far and wide, exploring small-farmer co-ops in Montana, inner-city rooftop greenhouses, sunless hydroponic gardens in shipping containers, farming programs in prisons that reduce recidivism and feed into a catering business and school lunches! Gustafson covers some familiar food-writing ground, of course, in her journeys--a review of our dependence on a few species, our over-use of pesticides, soil erosion, etc., but she has much to say that was new to me. For one, she questions the foodie law of "local is automatically better." As Gustafson points out, "An apple in a load of millions shipped cross-country in an efficient eighteen-wheeler might well account for fewer carbon emissions than an apple in a single bushel driven thirty miles to a farmers' market in an old diesel farm truck." It just depends. However, what local food does provide in spades, she discovers, is a host of intangibles: community building; "bolstering local food economies"; job creation; greater responsiveness between market and consumer; increased food security through preservation of species variety. The stories in Change Comes to Dinner are small, small Davids, in the face of Goliath agro-industry, but the sheer number of Davids Gustafson uncovers demonstrates how widespread is American interest in restoring connections to food, community and quality of life. Especially heartening were the stories of gardening programs for prisoners and inner-city youth, two populations historically without access to the earth or farms. Learning farming skills not only provided nutritious food, but also opened up professional opportunities and built confidence. Great stuff. While each little David may not make Goliath blink, much less bring him down, the sheer number of Davids might, when it becomes a larger cultural shift. Consider this last tidbit from the Wall Street Journal. Under pressure from McDonalds (which is itself under pressure), pig farmers are being encouraged to eliminate confining gestation stalls. As the article points out, McDonalds purchases 1% of the pork in America (! ), so when they talk, producers listen. Well, Americans eat 100% of those McRib sandwiches, and when we talk, McDonalds listens. And so it begins. Happy Valentine's Day! Treat the honeys in your life to great community food and go rake some hope!